A recent discovery at Stirling Castle may represent ancient harp music. Amongst 56 oak roundels displayed at the castle, dating from the mid-16th century, is a curious portrait of an anonymous woman. On the frame is a sequence of symbols, giving patterns using I, II and O. 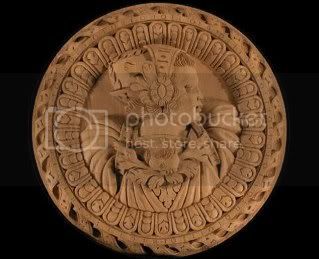 Wood carver John Donaldson, who has been making replicas of the heads for the past five years, made the original connection between the symbols and music. If this is indeed a musical sequence, it is directly reminiscent of the notation found in the Robert ap Huw manuscript, giving the 24 measures of string music used by medieval Welsh harp and crwth players. Those 24 measures are combinations of alternating sonorities, which contrast moments of tension (O) with moments of resolution (I). They serve as foundations for composing music. They are not tunes in themselves; rather, they provide combinations of varying lengths, which were employed by Welsh harp and crwth students to compose different generes of cerdd dant, or string music, in the late middle ages. They do not give any specifics, other than indicating points of harmonic change. Nothing tells us which pitches are to be used, which metre to use, how quickly or how loudly to play the music. Crwth player Robert Evans has written an article on binary notation on his Bragod website. Historical piper Barnaby Brown has articles on binary measures as a shared tradtion between string and pipe music on his Triplepipe website and also on his blog Demystifying Pibroch. Barnaby and I, along with John Donaldson, were involved in a media presentation at Stirling Castle on Wednesday 26th August, which was sponsored by Historic Scotland. Reporters from radio, television, magazines and newspapers were present, whose articles and broadcasts first appeared from Thursday the 27th August. During the presentation, Barnaby, John and I each talked about our contributions towards understanding the sequence and its significance. Barnaby and I presented a realisation of the sequence -- only one such interpretation amongst an infinite number of possibilities -- for voice and clarsach and also for clarsach solo. Barnaby sings vocables, used in the manner of teaching pipe music, known as canntaireachd. Click to download a transcription of the sequence. To create a performable piece of music, we needed to make decisions, and we chose to use a G mixolydian scale, with the resolution (I) being G and the tension (O) being F. We chose to interpret the II as a decorated I. Of course there are many possibilities for what this II may mean, including being an extended I, a sub-dominant harmony, or a phrase separator. Click to hear a composition based on the shifting tonalities. Historic Scotland issued an initial press release. The BBC News gives the best coverage, and also includes an audio clip of the voice and clarsach version. A video produced for the US daytime TV programme Good Morning America for some reason likened it to the blockbuster novel and film “The Da Vinci Code”. Newpapers and magazines which carried articles include the Times, Scotsman, Telegraph, Daily Mail (depressingly titling it "Da Tinkey Code"), and BBC Music Magazine.